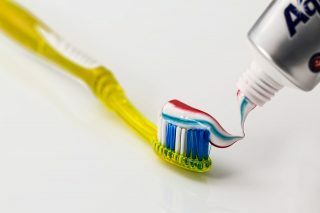 Approximately 75% of people don’t replace their toothbrushes as often as they should, but perhaps people will be more inclined to keep up with good oral hygiene habits when they hear about the new research suggesting that losing teeth nearly doubles the risk of developing dementia. A study of elderly people published in the Journal of the American Geriatrics Society found that those with between one and nine teeth remaining were 81% more likely to be diagnosed with Alzheimer’s disease within the next five years. For those with between 10 and 19 teeth left, the risk of developing the disease rose by 62% compared to those with at least 20 teeth remaining of the original 32. Those who had no teeth left at all have a 63% increased risk — probably because they have a whole set of false teeth instead. The overall findings of the study showed that good oral hygiene boosts mental health. Dr Tomoyuki Ohara, of Kyushu University, Japan, claimed that the more teeth people have, the less likely they are to develop Alzheimer’s. “Our findings emphasize the clinical importance of dental care and treatment, especially in terms of maintenance of teeth from an early age for reducing the future risk of dementia,” he said. Additionally, the findings show that tooth loss may also lead to people eating less healthily, while chronic gum inflammation can assist in dementia development. Between 2007 and 2012, Dr. Ohara and colleagues kept up with 1,566 Japanese men and women over the age of 60, and during that time, 11.5% of participants developed dementia, mainly Alzheimer’s. “This prospective cohort study of an elderly Japanese population demonstrated an inverse association between number of remaining teeth and risk of development of all-cause dementia and Alzheimer’s disease, indicating that subjects with greater tooth loss were at greater risk of onset of dementia,” said Dr. Ohara. Ultimately, the findings showed that taking simple efforts to maintain dental health could vastly reduce Alzheimer’s progression. Gum disease is widespread, and in older age groups, it’s considered to be a major cause of tooth loss.